Most of the cats I rescue are youngsters, but Tori is at least 10 years old. 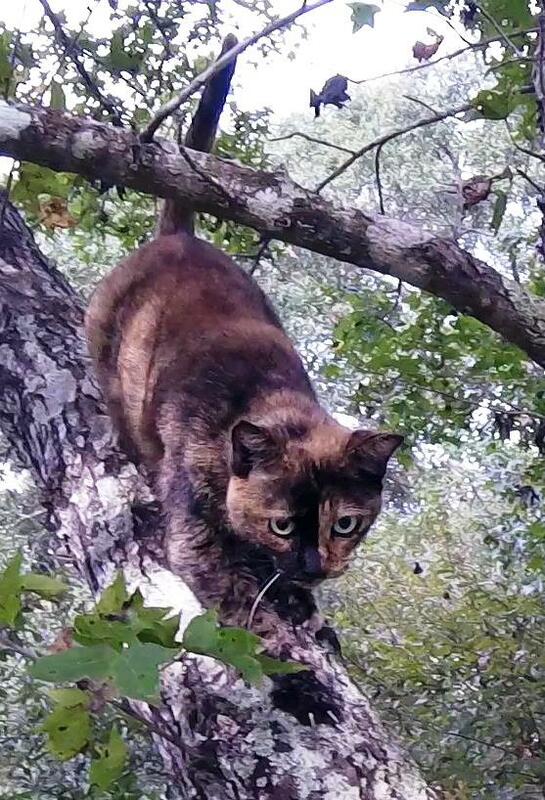 She is an indoor torti who slipped out the door and soon found herself stuck 50 feet high in a tree. Tori is not fond of strangers, so I was not expecting her to be cooperative in the tree. Unfortunately, she was in such an extreme position in the tree that I would have a very difficult time reaching her unless I could get at least a little cooperation from her. I spent several minutes planning how I was going to approach her, but, sadly, the tree didn't give me many choices. When I arrived, I watched as she walked down her branch all the way to the point where it joined the trunk. I was both pleased and impressed to see that, since the last several feet appeared too steep for her to manage. But if she was cooperative, then it was good to know just how far she could go. While I set up, Tori walked far out near the extreme end of her branch. She was not comfortable watching me come closer to her, so she wanted to be as far away from me as possible. 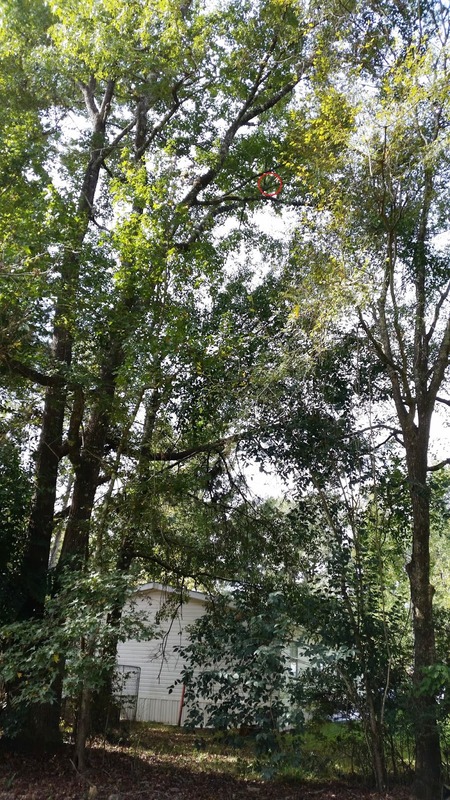 There was no way I could go out that far on the branch, so this rescue would be dependent on a little help from her. After I settled in at the beginning of her branch and saw that it was clear she was not happy to see me, I opened a can of food and watched for her response. Fortunately, she not only recognized the sound, she was also hungry and motivated enough to put her fear of me aside. Maybe this guy is an okay guy after all. Even though she had been quiet up to that time, she immediately started crying with excitement and began coming down to me. That was such a relief to me. If she could be enticed to come close to me, then I could rescue her. As she worked her way down the branch, I began to realize I had opened this can too soon. I was not ready for her. 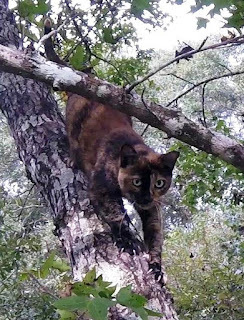 Even though I had already seen her walk all the way down the branch to the point where I was now standing, she would not do so again with me there taking up the only safe landing spot. 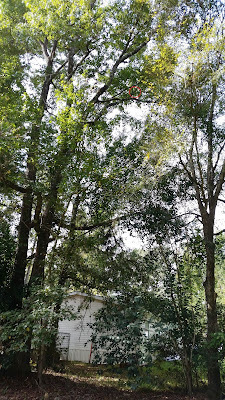 I really needed to go up a little higher where branch began its steep descent to the trunk and she could safely stand. She, too, realized that this wasn't going to work, and she turned around and went back out the branch. 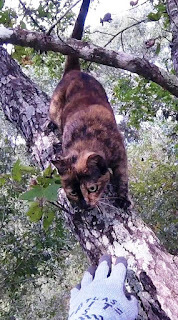 I went higher up the branch to where I was in reach of a safe landing spot for her and began to entice her down again. I had already asked how Tori feels about carriers and was told she had never been in one. Since she hasn't had a bad association with one, then I expected her to have no problem walking into one in the tree. So I had the carrier handy for when she came down. Tori cautiously worked her way down toward me, and the internal battle between her fear of me and hunger for the food was clear in her frequent changes of direction. Fortunately, the hunger won out, and she eventually came all the way down to eat. While she ate, she let me touch and pet her. After she ravenously ate a few bites, I put the food inside the carrier and began to hold it up to her. As hungry as she was, I was expecting her to walk inside very quickly, but, to my surprise, she was clearly frightened by the carrier and turned around and walked back up the branch. If I had just been ready with the bag, I could have had her by now, but I really thought she would go inside the carrier. I put the carrier away while hoping that I could entice her back down to me one more time. This time I would be ready with the bag. After I prepared the bag, I used the food to entice her back down again. Fortunately, after a few minutes, she came back down all the way to the same spot where she could eat the food. I petted her a couple of strokes and then grabbed her scruff. I threw the food down to the ground so I could use that hand to pull the bag over her. She didn't struggle while I held her, but when I let her go inside the bag, she began to fight it for a short time. But she was safely contained, and she settled down for the rest of her trip back home. Tori is doing just fine now, and her human family is very relieved to have her back and safe. And I am very relieved that she was cooperative.